love the pic at the top btw. it looks great. BTW, are you a creationist or do you believe in evolution? I think everyone's having fun in New York now..... TT-TT WHILE I'M STUCK IN NEW JERSEY MELTING MY BRAIN INTO MUSH WITH MOVIES AND EATING RAMEN!!! And Cpanda:You rock! I like the Beatles too. Ananka why are you posting articles about poor ducks getting killed!!!!!!!!!!! You've stopped the dog stories because that was a touchy subject and now you must stop the duck stories too. So add that to your list!!!! Unfortunately they're saying the puppy won't stay green. But it would be pretty cool if it did. 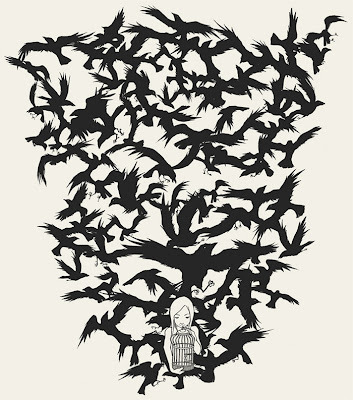 4) While I have no problem with snakes, and I usually LOVE birds, the crows are really creepy. I've never liked them, especially when they are agressive! 5) The water lights are completly awesome. I would LOVE to swim there, wouldn't you? And the wave picture is cool. 6) Did you say the cow was still growing???????????!!!!!!!!! 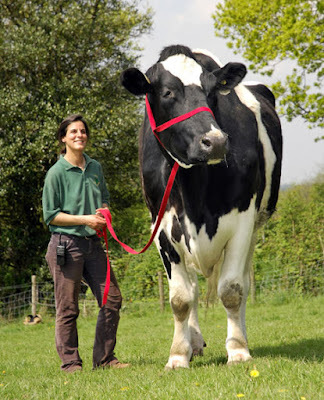 That is a HUGE cow! It's taller then the owner, even it's knees are gigantinc! 7)The frog tape is cool, but one thing I don't get is if it doesn't crack, how do you take it off so you can reuse it? 9)The squid egg sack is by far the coolest thing in this post, which is saying a lot because this was such an awesome post! I absolutly am researching more of that. That was a looong comment! It's really cool, I wish it would stay green!!!! Catgirl: Hmmm. What do you think? Lorna: It's nature, my dear. We eat ducks, pythons eat ducks. It ain't pretty. At least the little doggies were spared this time. the glowing things, i already knew bout em. watched one of those stupid "i shouldn't be alive" shows were these people got lost out at sea and at night whenever they moved it made the little sea lightin bugs light up. southern usa? crap, i have a friend who lives there. DONT DIE, KELLANDARINO!